Everyone has their favourite pasta. Some like theirs creamy, while others prefer tomato based ones. I’m a huge pasta fan and though I usually prefer mine with a tomato base, I think my preference has been tweaked a little. It all started when I heard from some friends that I should try the Garlic Prawn Pasta from Coffee Club. They all agreed that it was phenomenal. But I was a tad sceptical; I mean, it sounds rather plain – I imagined just some garlic and olive oil. Guess what? It wasn’t phenomenal, it was mindblowing! The first time I tried it, I shared it with my sister because we weren’t really hungry and we finished the pasta in less than 15 minutes! You should have seen us. We were both slurping up the noodles enthusiastically. When it was all gone, I thought how nice it would have been if it were a bowl of neverending pasta. What’s so great about it? The flavour. They are rather liberal with their garlic and the prawns are fresh and succulent. It’s deliciously tasty. It really is a simple pasta dish relying only on olive oil, garlic and chillies but somehow it manages to pull through really well! Both occasions when I had it, I didn’t manage to snap a shot because well, it was so yummy that I forgot! So anyway, the pasta was on my mind for days and weeks and I thought, how difficult would it be to make something like that? That said, I went on my own garlic prawn pasta conquest. I realised that even though I had the garlic, and chillies, there still lacked a certain flavour. It wasn’t tasy enough. I thought it had to do with the salt. But eventually, I thought why not try some chicken stock? And amazingly, it worked. Although I’m not sure if that’s what they use. I have a feeling that seasalt would work too. But I don’t have any in my kitchen currently. I’ve made my version of garlic prawn pasta a couple of times already and my sister likes it so I guess it’s not that bad? So now, when I crave for some, I know I can just whip one up without having to go all the way to Coffee Club. It’s really simple, this dish. I realised that I’m very much into natural olive oil based pastas now – like Aglio Olio and all. My next conquest is pesto. What’s your favourite pasta recipe/combination? I love that!! I tend to go for the bacon aglio or prawn aglio at pastamania. Will try coffee club’s version. Can trust you on that one. I agree on the olive oil based pastas–since I first tried Angel Hair with roasted vegetables and chicken at a nearby Italian joint last year it’s been a neverending love affair! i’m being helpful here! coffee club uses pesto paste in their garlic prawn pasta in addition to garlic and chilli, you can go try it haha. hey ! may i ask a question ? what is the difference between choc fondant and choc souffle ? Hey Cheryl, it was nice meeting you at the dinner even though we only had a brief chat. Keep baking! my all time quick-fix lunch combi: basil with garlic. Lots of garlic. Never fails a hungry soul. hey all! a few of you asked me for the recipe. but i’m afraid there’s none! when i made this pasta, i did it by feel. if i’m feeling like having more garlic, I just add loads more of it. otherwise, the main ingredients are just chopped garlic, chopped fresh chillies, fresh prawns, chicken stock and of course, pasta. 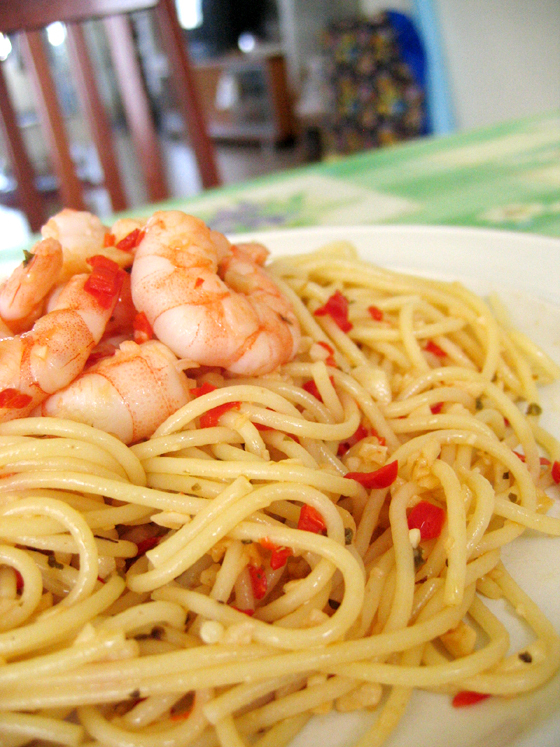 i fry the garlic first, then the prawns and after they’re cooked, i add the pasta. for flavour, i used chicken stock (can’t remember how much, just enough for taste) and the chillies go in last. 🙂 hope this helps! and i loved reading all your fav. pasta combinations. makes me crave for some pasta right now. Mmmmm… pasta rules! for “the baker”: add parsley stem when you toss garlic to oil, add parsley leaves and lemon juice after you toss in the prawns. DIVINE. That looks great! I love aglio olio with bacon or sausages. Simple and delicious! hey.. can i ask if we shld only use olive oil and not the “extra virgin olive oil”? ?cos the latter might not be able to take the heat? hello! May i know what’s pesto paste and where can i buy it? My favorite pasta too! The one from Coffee Club rocks!!! The trick actually lies in one of their ingredients; Knorr. I have been searching high and low for their imported Pesto from Knorr but could not find any. You can see the picture of the pesto here. Let me know if you came across it anywhere in Singapore.